There are over 80 million men, women, and children in Iran. Bombing them would be mass-murder. If the U.S. government and its allies bomb Libya and Iran when their governments choose not to have nuclear weapons, you can forget about North Korea and the rest of the world choosing not to have nuclear weapons. The longer the world has nuclear weapons, and the more countries that have them, the greater the likelihood of nuclear war. We now know that even a small nuclear war can block out the sun, kill crops, and starve everyone on earth who survives. Bombing people makes those who survive and many who care about them very angry, which is why the “war on terrorism” has predictably increased terrorism. Bombing people kills many, injures more, traumatizes even more, enrages even more, creates huge numbers of refugees, and destabilizes the region bombed. Bombing Iran will produce anti-U.S. and anti-Western and anti-Israeli terrorism. Bombing Iran risks direct war between the United States and nuclear governments including Russia. If you think people want to be bombed because of shortcomings and evil deeds of their governments, you’re not actually thinking at all; you don’t want to be bombed because of the shortcomings and evil deeds of your government. If bombing nations made people better off and created human rights, earth would be a paradise by now. Bombing countries is illegal under the Kellogg-Briand Pact without exceptions, and regardless of whether Congress “authorizes” it. Another country bombing you would be a crime regardless of which parts of its government “authorized” it. Bombing countries is illegal under the United Nations Charter with two narrow exceptions, and regardless of whether or not the U.S. Congress does or does not do anything. One of those exceptions is when the U.N. Security Council “authorizes” a war. It has not done so in this case and certainly will not. And doing so wouldn’t get you around the Kellogg-Briand Pact. The other exception is “defense,” but if anything is notdefense it is the bombing of a far smaller country half-way around the world that has not attacked or even threatened to attack your country. Israel is not a U.S. state. The Israeli government has been threatening, provoking, and lying about Iran for decades, which are not defensive behaviors. Saudi Arabia is not a U.S. state. The Saudi government has been threatening, provoking, and lying about Iran for decades, which are not defensive behaviors. Iraq is not a U.S. state. It is the smoldering ruin of a previous war launched on almost identical and wholly dishonest pretexts. Not only waging war is a crime, but threatening war is a crime under the United Nations Charter. The United States has been threatening war on Iran for decades, and any attack would follow that string of criminal actions. The idea that the government of Iraq or Israel or some other nation could invite the U.S. government to wage war against Iran in and from its territory does not exist in written law and would not legitimize yet another war in the eyes of the world. Gallup polling finds that in most countries out of 65 surveyed, people’s top choice as the greatest threat to peace in the world is the United States government. This needs to be countered, not exacerbated. It is hard to find anyone in the United States, and even in the U.S. government, who can even name every current U.S. war, much less every minor military action the U.S. military is engaged in. This is a sign that something has spiraled out of control. Including recent U.S. wars on Afghanistan, Libya, Syria, Yemen, Pakistan, Somalia, and Iraq, the United States military has, just since World War II, killed or helped kill some 20 million people, overthrown at least 36 governments, interfered in at least 84 foreign elections, attempted to assassinate over 50 foreign leaders, and dropped bombs on people in over 30 countries. In many cases, these actions have undone democracy. In none have they created or “spread” it. A nation possessing prohibited weapons is no legal, moral, or practical justification for war. If every lie about Iraq in 2002-2003 had been true, it would have been no justification for bombing Iraq. The United States did and still does possess nuclear, biological, and chemical weapons, and that doesn’t justify anyone bombing the United States. The very same people who told lies about Iraq are telling almost identical lies about Iran. They’re counting on you to have no memory, no sense of judgment, no ability to resist fear mongering and fluttering flags. They’re counting on you to fall in line and obey like a drooling idiot. In 2003, Iran proposed negotiations with the United States with everything on the table, including its nuclear technology, and the United States refused. Shortly thereafter, the U.S. government started angling for a war. War supporters said the United States urgently needed to attack Iran in 2004, 2007, 2015. It did not attack. The claims turned out to be lies. Even a U.S. National Intelligence Estimate in 2007 pushed back and admitted that Iran had no nuclear weapons program. The United States gave Iran nuclear energy technology and encouraged its use. Iran was attacked with chemical weapons by Iraq, in part provided by the United States, and refused to use similar weapons in response. Iran’s Muslim leader has forbidden the use or possession of weapons of mass destruction. The CIA gave Iran slightly and obviously flawed plans to build a nuclear bomb, as part of an effort to frame Iran, and the man who blew the whistle on that to Congress, Jeffrey Sterling, was sent to prison as a reward. The United States has imposed sanctions on Iran that have denied it green energy technologies and caused significant human suffering. It is one of the worst possible ways to blame victims when a government imposes sanctions that create deprivation, blames the suffering country for suffering, and justifies war as a result. Sanctions were used as a step toward war in the case of Iraq, and many in the U.S. government have been pushing for war on Iran since 1979. These include lots of nasty old war mongers who do things like sing the Beach Boys’ “Barbara Ann” changing the lyrics to “Bomb bomb bomb bomb bomb Iran.” If we let them bomb Iran they will never shut up. The United States has been lying about Iran having a nuclear weapons program for decades, as well documented by Gareth Porter and other journalists. The 2015 Iran nuclear agreement was not necessitated by anything Iran did. Iran agreed to tougher inspections than any other country on earth has ever agreed to, and those inspections have established that the agreement was not necessitated by anything Iran did. The agreement was an alternative to war, which many in the U.S. Congress and media were clamoring for and demanding urgently. The failure to launch the war then or on any of the previous occasions when it was supposedly urgently needed has resulted in nothing but further evidence that there is no need for a war. The White House has made clear that it wants to manufacture any possible excuse to abandon the agreement. Eventually, after numerous broken agreements, the nations native to North America stopped making or believing in agreements with the U.S. government. The nations of the world will do the same, if the United States refuses to abide by its commitments. Iran’s government is deeply flawed, but not in comparison with governments the United States arms and funds and supports. The U.S. government facilitates weapons sales from the United States to 73% of the world’s dictatorships, and gives military training to most of them. There is no correlation between where wars happen and where human rights are abused or democracy lacking or threats to world peace emanating. There is no correlation between where wars happen and population density or resource scarcity or religion or ideology. There is a strong correlation between where wars happen and where fossil fuels are produced. There is a strong correlation between which nations launch wars and which nations import fossil fuels. There is a strong correlation between which nations launch wars and which nations’ people accept war as a legitimate tool of public policy. There is a strong correlation between where the United States launches wars and where that small number of nations remains that have no U.S. military bases and accept no economic dictates from the United States. It’s good for the world, including the people of the United States, for such places to continue to exist, for the U.S. government not to become a world government by force of arms. Such an effort is doomed to failure and misery. Look at a map. Iran is surrounded by U.S. wars and bases. Its government has shown more restraint than recklessness in that context, perhaps, than the U.S. government might show were the Canadian and Mexican borders (in violation of laws of physics as well as of humans) lined with Iranian military bases. U.S. figures, including Senator John McCain, have spoken often over the years of wanting to overthrow the government of Syria and subsequently the government of Iran. The first step has been disastrous in human and in its own terms. The larger criminal goal of overthrowing Iran will lead to more disasters if it is not abandoned. Following the failure to overthrow Assad despite so much effort, a war on Iran would require extremely massive murder and destruction. Think of all the crazy people who have ever held power in Washington, D.C. Attacking Iran was too crazy for them. Trump campaigned for office, like most candidates before him, claiming to oppose overthrowing governments, and admitting what disasters are produced by doing so. Military families in swing states made the difference (as did thousands of other factors in that close election) by turning against Hillary Clinton, believing she would be more likely to engage in more wars. In fact, polling has long found the U.S. public to favor a significant reduction in military spending, greater use of diplomacy, and fewer wars. Waging wars for democracy is not terribly democratic when the people don’t want them and are not allowed any say in the matter. When Korea announced plans for peace in April 2018, major U.S. weapons companies’ stocks plummeted, and propaganda for a war on Iran surged. Congress and President Trump in 2017 pushed military spending up to well over 60% of the federal discretionary budget, stripping funding away from human and environmental needs at home and abroad. That trend of many years cannot be reversed unless the wars are stopped. Converting to peaceful industries would involve so much savings that anyone in need could be re-trained and assisted in the transition. Bombing Iran would be an environmental catastrophe for the earth far outstripping any green energy efforts you’re engaged in. Maintaining the U.S. military in preparation for the possibility of bombing Iran — a possibility that grows with every threat of peace breaking out in Korea or between the United States and Russia — is an environmental catastrophe for the earth far outstripping any green energy efforts you’re engaged in. A war on Iran would easily cost more than, and a small fraction of annual U.S. military spending is more than, what it would cost to end starvation on earth, or end the lack of clean drinking water on earth, or make U.S. colleges free, or convert the United States to clean energy, or quintuple actual non-weapons U.S. foreign aid, or build fast trains connecting all major U.S. cities. The way to alleviate refugee crises is to halt existing wars and put a fraction of their cost into aiding refugees, not launch new wars that leave many more people homeless. A United States government responsible for providing clean drinking water, schools, medicine, and solar panels to others would be more secure and face far less hostility around the world, and it could become such a benefactor for far less than it spends making itself hated. With every war for freedom we can count on losing more of our actual freedoms, and that would be all the more so with a war as crazy as an attack on Iran. An attack on Iran would also require intense propaganda fueling the racist and Islamophobic bigotry already on the rise in the United States. Results in the United States can be safely predicted to include: more racist violence, even more militarized policing, restrictions of speech and assembly, and a rise in fundamentalist religious hatred and gun sales. Results in the United States can also be counted on to include: cuts to all human and environmental needs, and a major pushback against all progressive political initiatives in the name of war. If the U.S. government bombs Iran, then that insane NRA video with Charlie Daniels demanding a war on Iran — which you may have thought was merely a ploy to sell guns to fantasy backyard warriors — will have gotten what it said it wanted. That lunacy will be U.S. policy. If the U.S. government bombs Iran, Netanyahu will openly tell the world that the United States and its people are a bunch of easily manipulated chumps. If the U.S. government bombs Iran, John Bolton will never be off your television channel, and any station without him will have his mustache on. The U.S. ambassador to the United Nations claims that Iranian weapons have been used in a war that the U.S., Saudi Arabia, and allies are illegally and disastrously waging in Yemen, creating the single greatest human catastrophe on earth, the worst famine seen in ages, and the worst outbreak of cholera ever in the world. That’s not a justification to impose similar suffering, or any suffering, on the people of Iran. While Iranian militarism should be ended, Iran spends less than 1 percent what the United States does on militarism, and the comparison in terms of foreign weapons sales is even more extreme. It is hard to find a war anywhere on the planet without U.S. weapons in it. In fact, a report that made news the same day as the ambassador’s claims about Iranian weapons pointed to the long-known fact that many of the weapons used by ISIS had once belonged to the United States, many of them having been given by the U.S. to non-state fighters (aka terrorists) in Syria. Alternatives to war include the rule of law. Iranians suspected of crimes, like Americans and Saudis and anyone else suspected of crimes, should be prosecuted or otherwise held accountable through processes of truth and reconciliation. Committing more crimes does not reduce crime. Prime Minister Netanyahu should be questioned about sharpshooters murdering nonviolent demonstrators in Gaza, not listened to as he proclaims the same baseless lies about Iran that he did 16 years earlier about Iraq. The United States overthrew Iran’s democracy in 1953 and installed a brutal dictator / weapons customer who lasted until 1979. Iran has never done anything like that to the United States. The United States shot down an Iranian civilian airliner, killing 290 people. Iran has never done anything like that to the United States. The United States has labeled Iran an evil nation, attacked and destroyed the other non-nuclear nation on the list of evil nations, designated part of Iran’s military a terrorist organization, falsely accused Iran of crimes including the attacks of 9-11, murdered Iranian scientists, funded opposition groups in Iran (including some the U.S. also designates as terrorist), flown drones over Iran, openly and illegally threatened to attack Iran, and built up military forces all around Iran’s borders, while imposing cruel sanctions on the country. Iran has never done anything like any of these things to the United States. The United States now has a president who seeks the approval of people who want to bring about the end of the world in the Middle East for religious reasons, and who have praised President Trump’s announcement of moving the U.S. embassy in Israel to Jerusalem for just those reasons. The reason why “real men go to Tehran” is that Iran is not the impoverished disarmed nation that one might find in Afghanistan, Iraq, or Libya. Iran is much bigger and much better armed. Whether the United States launches a major assault on Iran or Israel does, Iran will retaliate against U.S. troops and probably Israel and possibly the United States itself as well. And the United States will without any doubt re-retaliate for that. Iran cannot be unaware that the U.S. government’s pressure on the Israeli government not to attack Iran consists of reassuring the Israelis that the United States will attack when needed, and does not include even threatening to stop funding Israel’s military or to stop vetoing measures of accountability for Israeli crimes at the United Nations. President Obama’s ambassador refrained from one veto on illegal settlements, while President-Elect Trump lobbied foreign governments to block the resolution. As in any country, no matter what its government, the people of Iran are fundamentally good, decent, peaceful, just, and fundamentally like you and me. I’ve met people from Iran. You may have met people from Iran. They’re not a different species. They’re not evil. A “surgical strike” against a “facility” in their country would cause a great many of them to die very painful and horrible deaths. 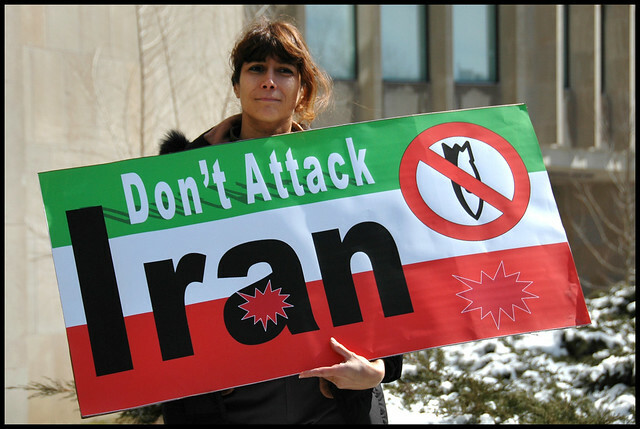 The proponents of attacking Iran themselves admit that if Iran had nukes it would not use them. This is from the American Enterprise Institute: “The biggest problem for the United States is not Iran getting a nuclear weapon and testing it, it’s Iran getting a nuclear weapon and not using it. Because the second that they have one and they don’t do anything bad, all of the naysayers are going to come back and say, ‘See, we told you Iran is a responsible power. We told you Iran wasn’t getting nuclear weapons in order to use them immediately.’ … And they will eventually define Iran with nuclear weapons as not a problem.” Is that clear? Iran using a nuclear weapon would be bad. But what would be really bad would be Iran acquiring a nuclear weapon and doing what every other nation with them has done since Nagasaki: nothing. That would be really bad because it would damage an argument for war and make war more difficult, thus allowing Iran to run its country as it, rather than the United States, sees fit. Of course it might run it very badly (although we’re hardly establishing a model for the world over here either), but it would run it without U.S. approval, and cease to be an argument for military spending increases, and that would be worse than nuclear destruction. Ahmadinejad did not say “Israel should be wiped off the map.” A more accurate translation was “the regime occupying Jerusalem must vanish from the page of time.” The government of Israel, not the nation of Israel. Not even the government of Israel, but the current regime. Hell, Americans say that about their own regimes all the time, alternating every four to eight years depending on political party. Iran has made clear it would approve of a two-state solution if Palestinians approved of it. Violent solutions are less likely to succeed than nonviolent ones, especially violent solutions in search of a problem to justify them. The tools of nonviolence are developing quickly and racking up successes. They are more likely to achieve good ends, and those successes are almost always far longer lasting. The United States government needs to catch up with the times. The choices are not (a) bomb another country, or (b) do nothing. Other choices include aid, diplomacy, the rule of law, disarmament. Every time people try to urgently rush us into a bad choice, we can point out all the years in which we could have been transforming the world with a whole variety of good choices. We could start making those choices now. But those who want peace have to be as organized and determined as those who want war. We have to actively demand diplomacy and sanctions relief and aid and cooperation and arms embargoes and conversion. There is no such thing as arriving at a war as a last resort. War is a choice. A “hawk” is nothing other than someone who prefers to choose war. There is everything to be gained by making peace with Iran, governmentally, culturally, economically. Persian history is at the roots of Western history and could be studied as such. Cultural and academic exchanges with a country that produces wonderful art, films, books, food, and a soccer team that actually qualifies for the world cup would be far preferable to yet more war. A U.S. war on Iran, with or without a handful of partners or sidekicks, would unite the people of Iran and much of the world against the United States. It would justify in the eyes of much of the world an underground Iranian program to develop nuclear weapons, a program that does not now exist. The environmental damage would be tremendous, the precedent set incredibly dangerous, all talk of cutting the U.S. military budget would be buried in a wave of war frenzy, civil liberties and representative government would be flushed down the Potomac, a nuclear arms race would spread to additional countries, and any momentary sadistic glee would be outweighed by accelerating home foreclosures, mounting student debt, and accumulating layers of cultural stupidity. The “news” broadcasters who called Trump “presidential” when he started bombing people on a small scale would declare him something just short of king for life if he bombed Iran. This entry was posted in All Posts News Politics and-or Videos, Anti-war, Imperialism, Iran, Iraq, Israel, Nukes, Politics, Saudi Arabia and tagged David Swanson, Donald Trump, Iran Israel US Nukes, Iran Nuclear Deal, Same As It Ever Was, Sanctions. Bookmark the permalink. Iran has also said they are using nuclear energy for electricity while keeping oil and gas for export. Those who signed the UN Charter should be punished for breaking the promise of no more war. They were expressly set down to halt the rise of another Nazi-like regime hell bent on destroying countries under any circumstances. Your number 10 jumps off the page for me. Thanks, Dennis. I really like No. 10, too.